Another Natural Gas Debacle in the Making? Add Bank of Montreal to the list of casualties in the natural gas pit. BMO Financial Group reported lost between C$350 million and C$450 million speculating in out-of-the-money natural gas options. Fortunately this was only $400 million in real money. In terms of natural gas debacles, this is a small one compared to the $6.5 billion that Amaranth Advisors lost trading natural gas last fall. MotherRock LP and Ritchie Capital Management are already on the list, too. The Commodity Futures Trading Commission (CFTC) reports open positions in natural gas in the weekly Commitments reports. Option open interest and traders’ option positions are computed on a futures-equivalent basis using delta factors supplied by the exchanges. It’s all Greek to me (and to Bank of Montreal as well according to reports). What does the CoT report say about the prospects for additional trading casualties? The news is not good. Last year, CTA and hedge funds were so sure of a gas crunch that they did something we do not see very often. After being burnt by going short during the August to December 2005 rally, they began buying on a scale down as prices swooned through the first 9 months of 2006. In December 2005 the funds had accumulated 90,000 short contracts at an average cost of about $8.70 per million British Thermal Units (MMBTU). The notional value of their short position was (at cost) was $7.8 billion, and when prices reached15.500 in December it was under water to the tune of about $6 billion. I don’t want to get too technical here, but we often use the term “zigging when you should be zagging” to describe this maneuver. Anyhow, less learned. Right? Not really. The gradual rise in gas prices since last September allowed the funds to cover their shorts but when prices retraced some of those gains in December 2006, the funds knew what to do. They weren’t going to get caught buying into a price collapse this time. No sir. They were intent on sell short . It’s just that in January, gas prices recovered about half their December losses, but the funds continued to short and reached an all-time record net short level in March, and are still shorting through the current report. 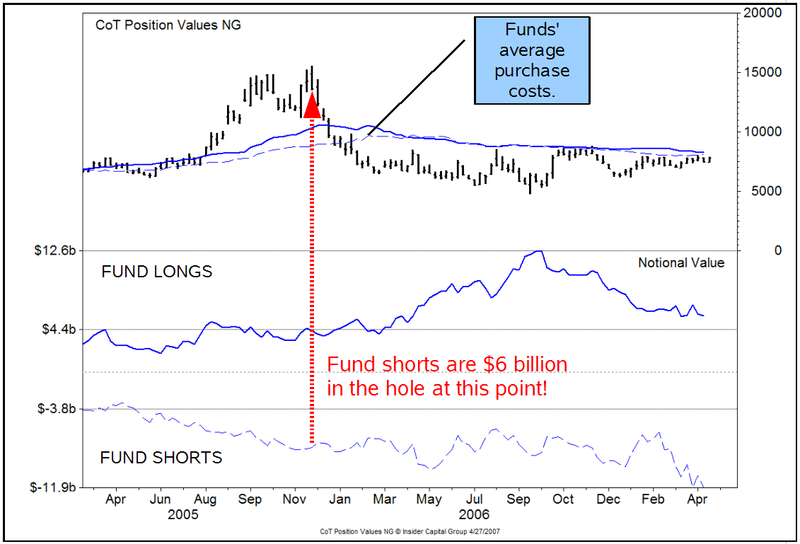 In fact, their net short total (longs – shorts) set a new record in the latest report. Which will work out fine for them if prices will just tumble. Trouble is they added 70,000 new shorts (that’s $5.5 billion worth at Friday’s closing price) without bumping prices down a lick. Now they find themselves holding a record number of outright shorts with a notional value of $11.9 billion, with a very small open profit of about $385 million. This evaporates if prices rally to 8.100. (And their long position would still be underwater). Granted that profits on longs would help the aggregate as prices rise, but just a little because the funds long position is only half their short total. With fund bears holding a record position and fund bull holding their lowest long total in a year, there could be a lot of shortcovering and new buying tripped off by a slight price increase. It is doubtful that this large a short position could be covered without the funds’ own buying moving prices against them significantly. What could start this rally? Any number of things, and the Atlantic-Gulf of Mexico hurricane season is just 30 days away (June 1).